With Back To Mono, Boyd Rice returns with the first NON album in over 10 years. 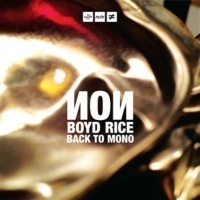 While the last one Children of the Black Sun was shrouded in Grail and Gnostic themes, Back To Mono sees Boyd Rice return to his noise roots, for the most part. In doing so he has enlisted the support of Z'ev - their friendship stretches way back to San Francisco in the seventies - and Wes Eisold of Cold Cave as collaborators, with Bryin Dall of Thee Majesty, 4th Sign of the Apocalypse and more recently as one-half of Hirsute Pursuit - which of course featured Boyd on their cover of David Bowie's 'Boys Keep Swinging'- on production duties. Back To Mono may be marketed as a new album, but it doesn't present all new material. Instead we have a collection comprising new tracks, old tracks, live recordings, re-recordings and a cover of The Normal's 'Warm Leatherette'. As a result it's a bit of a mixed bag. Back To Mono appropriates Phil Spector's appellation, though Spector's more famous description "wall of sound" may have been more fitting as Boyd Rice, like that ladykiller Spector, has a tendency to use layered, echoed techniques albeit towards different ends. That said, 'Turn Me On, Dead Man' the opening track here recorded with veteran industrial percussionist Z'ev features layers of trippy psychedelic noise, panning between speakers, over rudimentary bass and drum section, which sounds lifted from a sixties track. It's remarkably poppy and very woozy sounding - queasy listening for iron youth, maybe! 'Watusi' appears to be a rerecording by Cold Cave's Wes Eisold of an unreleased NON piece from 1978. I can't tell if it's a NON recording, re-rerecorded by Wes Eisold or a recording by the Cold Cave/Heartworm Press mainman. Either way it's a prime example of Boyd's manipulated looped noise, its textured outpourings generating rhythm. 'Back To Mono' is itself a wall of noise, entering like the opening rush of an early distorted Mary Chain track, garnering a colossal roar with its dense repetitions comprising low bass rumbles and shredded tones generated from a paint stripper. It manages to bridge the gap between early NON where he used all manner of sound devices including shoe-polishers and roto-guitars and contemporary noise of NON found here. The other new tracks include 'Obey Your Signal Only' where Jajouka type pipes are looped and multi-tracked into a hypnotic type drone and 'Man Cannot Flatter Fate' which is a dense mass of crunchy, corrosive textures. Back To Mono features two live cuts from New York performances. The first, 'Seven Sermons To The Dead', taken from a Heartworm showcase at Santos, New York in 2009 has barely discernible words from Boyd quoting Carl Jung over atmospheric keys and a quivering piercing shriek. The other is a pared down minimalist version of the title track. The other live cut is 'Scream' which captures the looped churning noise and bellowed cries from a vintage 1979 live performance at the Whiskey a Go-Go in Los Angeles, more akin to the live noise work found on Physical Evidence. And while much of Back To Mono heralds a return to Rice's noise roots, some tracks evidently don't. With processed martial drums and lyrics delivered like a declamation, paraphrasing the Greek philosopher Heraclitus, of 'Fire Shall Come' is lifted straight from the Boyd Rice and Fiends album Wolf Pact. It's a good track, cut from the same cloth as Boyd's "might is right" signature tune 'Total War', which provides a neat indication to his work with Douglas P. of Death In June but, like 'Seven Sermons To The Dead', it isn't really noise. Both of these tracks are much more representative of NON's work from the nineties onwards where he mixed scornful spoken word using texts from esoteric works and age-old philosophers with ambient and martial rhythms. A cover of The Normal's fetishistic car-crash fantasy 'Warm Leatherette' closes Back To Mono. The Ballardian theme of the original remains intact, but it's a hangover from Boyd's thwarted collaboration with Giddle Partridge minus Go Go Giddle's co-vocals. What 'Warm Leatherette' does, though, is bring things full circle, as this was the single Boyd bought in Rough Trade, London, minutes before meeting Daniel Miller the founder of Mute Records who went on to make Boyd the first signing to his Mute label.